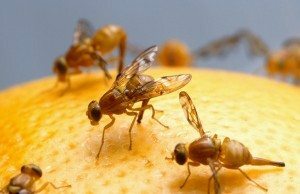 Fruit flies are certainly annoying, even if they are not harmful.There are several DIY methods of catching/killing them that are claimed to work, and one of the most common is with the use of apple cider vinegar. Let’s take a look at how to use apple cider vinegar to kill fruit flies. Fruit flies are drawn to the fruity scent of apple cider vinegar and simply cannot resist going after it. So why would you want to feed them? Because the dish soap is used to break the surface tension of the vinegar, and the fruit flies will drown when they try to land for a drink! You must use apple cider vinegar and not balsamic, red wine, or white distilled. 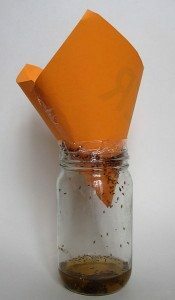 The fruit flies will not be attracted to any of those other kinds, and the trap simply will not work. The basic trap is simply to place about 1/2 cup of apple cider vinegar in your mason jar, and add 1-3 drops of dish soap. This alone should be enough to begin capturing fruit flies. Some instructions call for a slightly more advanced setup, where you use a funnel (such as one made by rolling a piece of paper at an angle) to make it more difficult for the fruit flies to escape once they have entered the jar. This step is not necessary, as there is no escape for them once they attempt to land on the apple cider vinegar. Another tweak you can make to the method is to place a piece of rotting or overripe fruit into the apple cider vinegar. This should make is even more likely to attract the fruit flies, but will also produce a stronger smell that you will have to deal with. This type of fruit fly killing trap definitely works! Myself and countless other people have reported success with it. Are you using the right kind of vinegar? – Only apple cider vinegar will work, not any other kind. Are you setting up the trap correctly? – You must use a large enough jar, with enough apple cider vinegar and a few drops of dish soap. In addition, try one of the variations mentioned above. Are you putting the trap in the best location? – For best results, try to place the trap as close to where you’ve been seeing fruit flies as possible. Have you waited long enough? – Although results are sometimes seen within minutes, in will usually take 24-48 hours to capture a majority of the fruit flies in the area. This non-toxic spray kills larvae, eggs, and adult insects by breaking down their exoskeleton. 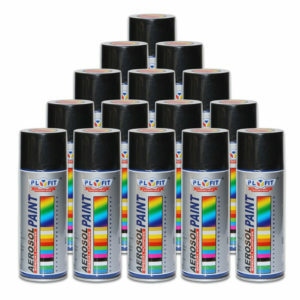 It is safe to spray around the home and works only on the insects. Feel good about spraying indoors around pets, plants and children. Fill out the questions below to find local services in your area!